When Yamaha displayed the Crossplane Triple concept at INTERMOT last year, it made it clear that a three cylinder bike was headed for production. That bike was revealed in private to a group of journalists here in Southern California last week (you can see me sitting on the bike at the bottom of this article). 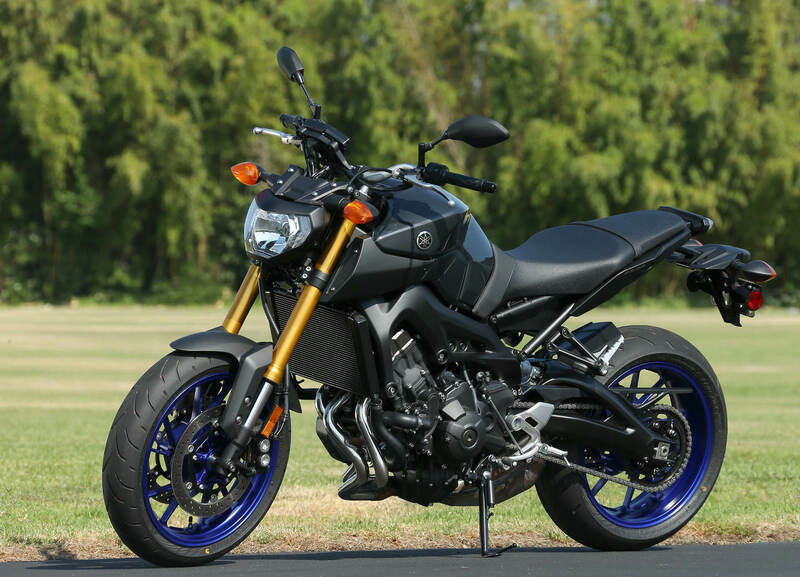 It will be known as the FZ-09 when it hits dealers in the U.S. late this year (the same bike is called the MT-09 in Europe). 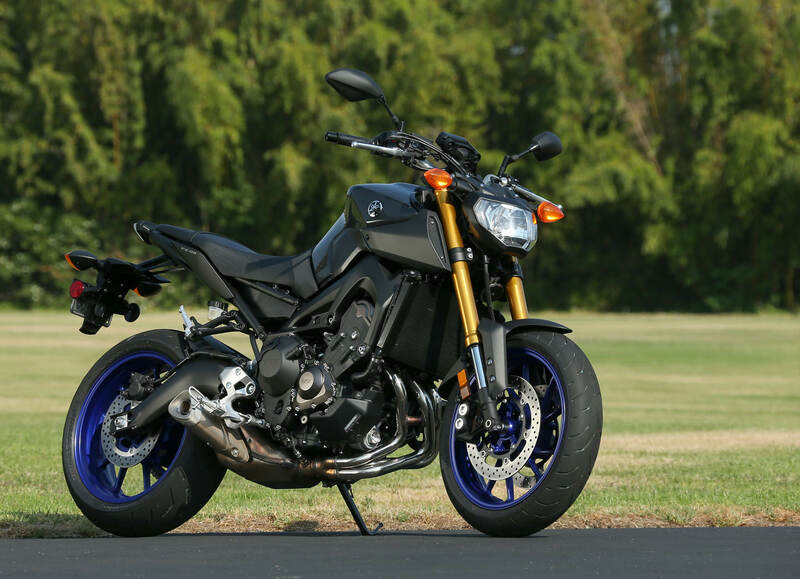 The FZ-09 is a small, light and powerful 847cc three-cylinder with a remarkably low U.S. MSRP of $7,990 ($1,400 cheaper than the less powerful Triumph Street Triple, for instance). The new FZ-09 engine features even, 120 degree firing intervals, together with unique, unequal length intake funnels. It has four-valve heads and fuel injection, as well as a relatively short stroke (78 mm bore and 59.1 mm stroke) with an 11.5-1 compression ratio. The transmission is a six-speed. 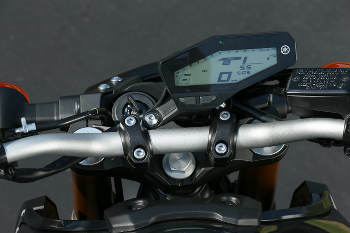 Ride-by-wire throttle and Yamaha D-Mode, which allows switching between three throttle-control maps for different performance characteristics, is also included. A counter-rotating balance shaft keeps things smooth. U.S. Yamaha representatives would not give us a peak horsepower figure, but Yamaha Europe is quoting 115 bhp at 10,000 rpm. We were given a peak torque figure of 65 foot/pounds, which should arrive at 8,500 rpm. 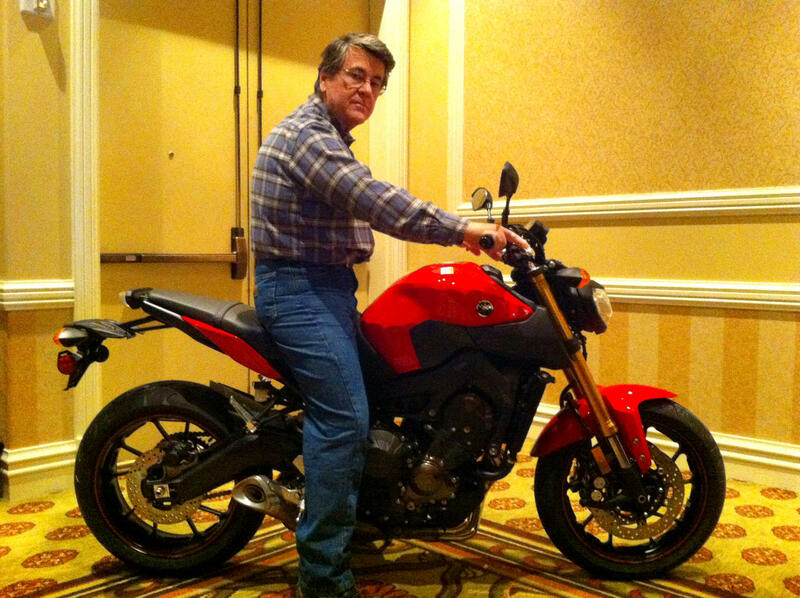 When we sat on the FZ-09, it felt very small and light (see pictures below – for scale, I am 5’11” tall with a 32′ inseam). Claimed wet weight (with 3.7 gallons of fuel) is 414 pounds, meaning that the claimed dry weight would be in the neighborhood of 390 pounds, or less! On paper, this is an awful lot of torquey engine in a lightweight package. 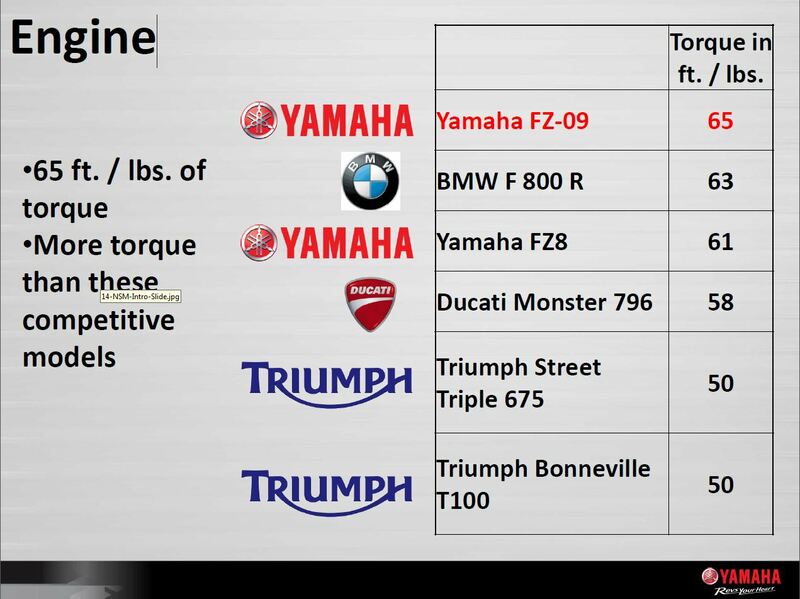 Speaking of torque, as the table below indicates, Yamaha’s technical specifications indicate the FZ-09 will have 30% more peak torque than the Triumph Street Triple, for instance, while the Yamaha weighs just a few pounds more than the Triumph. 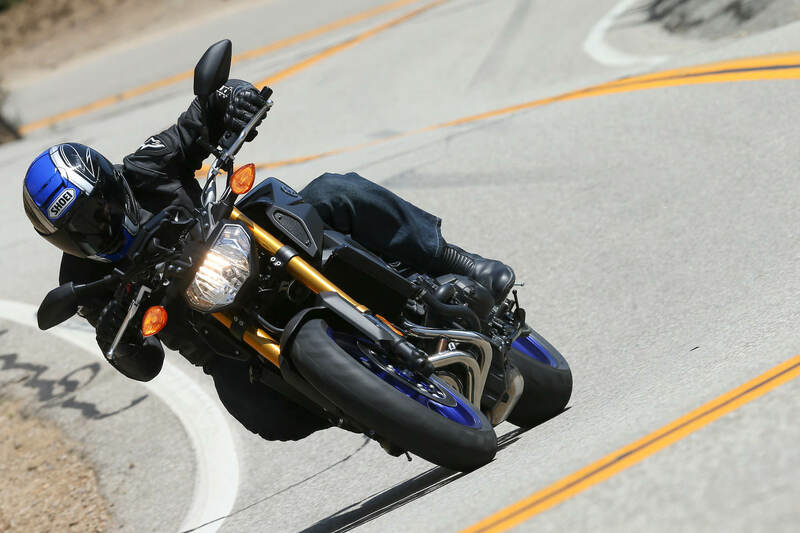 Having just stepped off the Street Triple, the FZ-09 should be mighty quick at real world speeds and rpm levels. Both the fork and shock are adjustable for preload and rebound. The riding position is very upright (very much like a supermoto or dirt bike). I had just tested the Triumph Street Triple, which is a very narrow motorcycle at the footpegs and the knees. 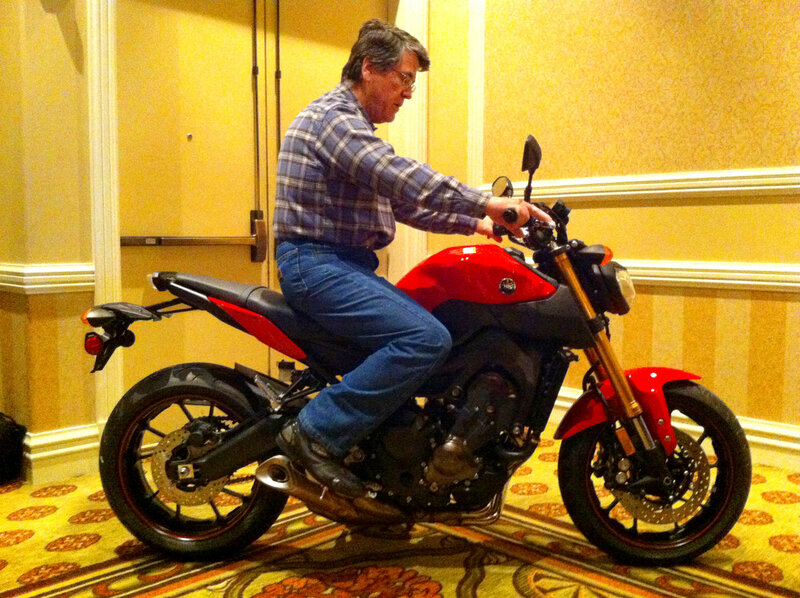 The new FZ-09 felt narrower, in part due to deep scallops in the fuel tank. Yamaha’s FZ8 is being discontinued. 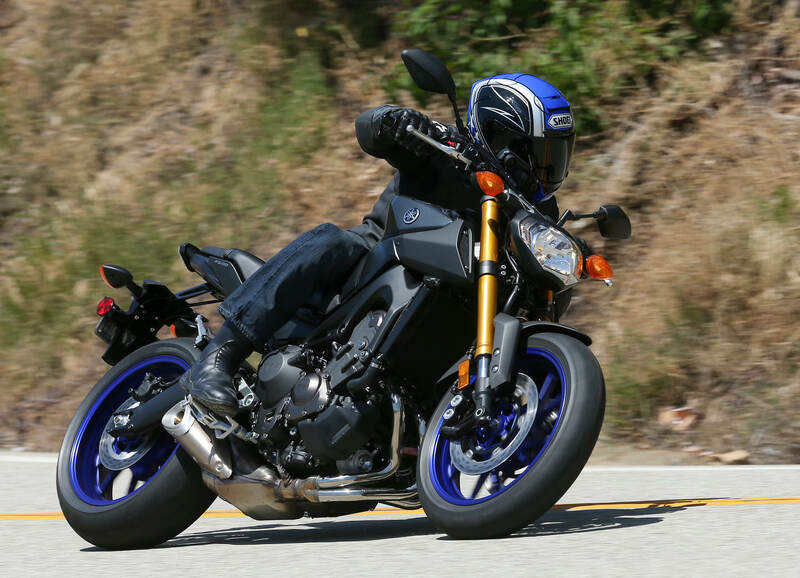 Comparing the old 800cc inline four with the new FZ-09, the FZ-09 is less expensive, 53 pounds lighter (with wheels that are nearly a pound lighter) and more powerful. Progress, indeed. The United States press launch for the FZ-09 will be held in approximately three months. We expect to be there, and we can’t wait. Here are the specs published for the identical bike in Europe, the MT-09, as well as additional photos. You can also visit Yamaha’s web site. Easily flat footed with a 32″ inseam. This is what the Super Ten and/or a new TDM should be based on. Other than the ugly headlight I really like this bike, and I can probably see me on one…but preferably with a small fairing. I mostly like the looks, except for what appears to be the V-Max inspired fake air intakes. I look forward to a full ride report. The specs are right on with this bike, unfortunately Mr. Yamaha has a very hard time in the design department. If the bike had a proper gas tank and ditched that funny looking seat it would sell better. I’m willing to bet I will never see a single one on the road. Really? What’s a “proper” gas tank? And how does this seat not look like just about every other naked Japanese bike on the road? Unless you live in Alaska or Hawaii, but still live in the US, name one mass-produced motorcycle of the modern era in this price range that you have not seen multiple times on the road. I like everything about this bike, so if you’re in LA and see me riding one, you’ll be wrong. Your comment shows your low information voter status. This bike truly rocks, you will see them all over. And in different categories, ie. dual purpose. Yamaha really nailed it (for me) with this one. Trying to decide between a Honda 599 or 919 and then this thing comes out. Only gripe is my short legs but that’s overcome easily enough. Well done, Yamaha! Ahh…! my flintstone thumbs are in hell…! Finally, something worth looking at from the Japanese that does not have a full fairing and clip-ons. Just might have to find the space for this even though being a new father I rarely get to ride anymore. I wonder if it will sound as nice as the triumphs? You just know it will be reliable. Agree 100%, this is the best bike all things considered that has come along in a while. Get this bike, I’m thinking of getting one and being glad I did. 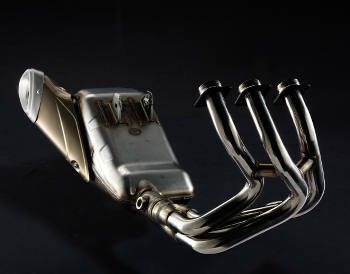 It has to sound amazing, Moto GP inspired exhaust, this bike rocks, yes way to go Yamahammer. This looks fantastic! I’m very much looking forward to taking a test ride. The gap between the headlight and the tiny console (that’s practically a bicycle computer, bet they saved some coin there..) along with the 4 bolts on the cover between them seem to invite the aftermarket (maybe Yamaha themselves) to make a bitchin’ bikini fairing for this. I’m ready for the return of the TDM850 based on this platform. Basically this bike in Multistrada-esque trim. And roomier dimensions please. Don’t size it like a Versys just because it can be. A TDM variant should be roomier than a Versys. Between a Versys and a Multistrada would be perfect. Just as the engine displacmenet is between the two. Loved my old TDM but a lighter weight triple version would really light me up. 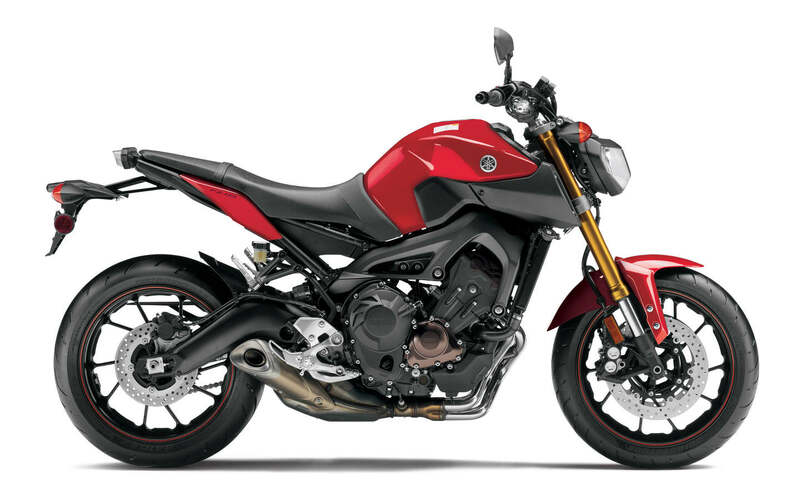 Like this FZ-09… seems like great overall package. Prefer Yamaha bring the MT-01 over here…. Um. though I entirely agree with you about bringing the MT-01 over here, why the post listing all of your bikes? I’ve been riding for 31 years and have owned 31 motorcycles (including several Yamahas), but don’t feel the necessity to list them all following an article about a particular motorcycle. More Power than the the Triumph but it is 175cc larger. Compare it to a Speed Triple @ 133 hp. Apples to oranges. Nice looking bike and Yamaha did make a triple 30 years ago. Given the $8000 price point, it’s far more comparable to the Street Triple. The Speed Triple is nearly double the price of the Yamaha… now, *that* would be an apples and oranges comparison. MSRP dictates comparisons for most people, not engine size. Street bikes don’t need to conform to any sort of displacement limits, so they’re largely meaningless.